Garden Island and the ghost ships. My recent piece on When Maps Lie gave rise to some thinking about when Google Maps intentionally tries to hide things at the request of the Government. The Internet reports several such places in Australia, and many, many more around the world. The Australian ones don’t seem to hold up to much examination. Both Garden Island and the nuclear facility at Lucas Heights are often reported as being blurred out, but both seem to be available in astonishingly clear detail. With one exception. 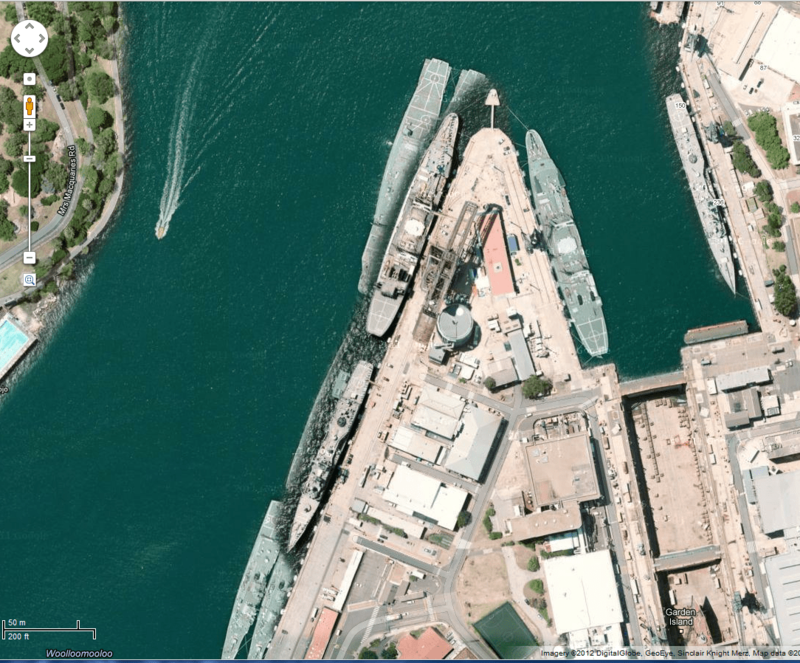 If you take a look at Google’s satellite view of Garden Island the land seems to be there but there are ships superimposed upon one another. It appears to be some strangely ham-fisted Photoshopping and I’m struggling to see the point of it. Strange. Chinese officials consider censorship demands as state secrets, so we cannot disclose that information at this time. I prefer our ghost ships to ghost censorship. EDIT: It’s always a shame when the facts get in the way of a good conspiracy theory. Thanks to crowd-sourcing an explanation from Reddit, it’s clear that the effect is an overlap between the higher-resolution photos Google uses over land and the lower resolution ones it uses over sea. A strange look, but totally explained.